Saving The World's Babies Simply Starts Before Birth : Shots - Health News There has been great progress in improving the health of most young kids, but newborns have not seen the same success. Researchers know the main causes of death. The challenge now is combating them. Shefali Rani Das, an expectant mother in Bangladesh, has given birth to six children (including 4-year-old Suborna) at home without a doctor. Only three of her babies have survived. Every day, all over the world, newborns die when they don't have to. They die from preventable infections and because their tiny bodies can't stay warm enough. Shefali, a mother from Bangladesh, knows this global tragedy all too well. "Whenever a child is born and then dies, we're overwhelmed with grief," she says. "It's terrible." Shefali has given birth to six children at home in her village in Bangladesh. Only three of her babies have survived the first week of life. "We feel like we need to take the child to the doctor, but we can't," she says in a new report, from the non-profit aid group Save the Children. "I'm not the only one here who has lost children — there are many other mothers like me." Many of these deaths are not inevitable, doctors say, but innovations aimed at preventing them are just beginning to be deployed. The U.S. Agency for International Development is among the groups trying to speed progress. In April, it announced a Global Development Lab that will focus on newborn health, especially the first two days of life. That's because while the global mortality rate among young children has dropped almost 50 percent since 1990, most of those gains have been made among toddlers, not newborns. About 15 years ago, there was a lag in research on preventing the deaths of babies compared to slightly older children, says Dr. Abdullah Baqui, director of Johns Hopkins' maternal and newborn health center. Baqui has since shifted his own efforts toward infants because he feels they needed more attention. "I think we know what needs to be done now," Baqui says. Community health workers are key, as are simple care techniques — like having mothers hold newborns to their chests to keep babies warm. The challenge is how to get the word out, and get trained workers in place. Unsurprisingly, most of these neonatal deaths are happening in developing countries — the highest rates are in sub-Saharan Africa. So solutions have to be cheap and accessible to make a real impact. Source: UNICEF "Levels And Trends In Child Mortality Report 2013"
The major causes of newborn deaths worldwide are infections, preterm births and complications during labor and delivery. Infections come in different forms. It could be pneumonia, which hits newborns particularly hard. Immunization and breast-feeding can help ward off the lung infection. Babies might also pick up infections if they're born in unsanitary places. Baqui's team at Johns Hopkins is working on an antiseptic for the umbilical cord that can help in those cases. His group is also looking at whether testing for infections in the pregnant women and treating them could prevent a second adversary: premature birth. 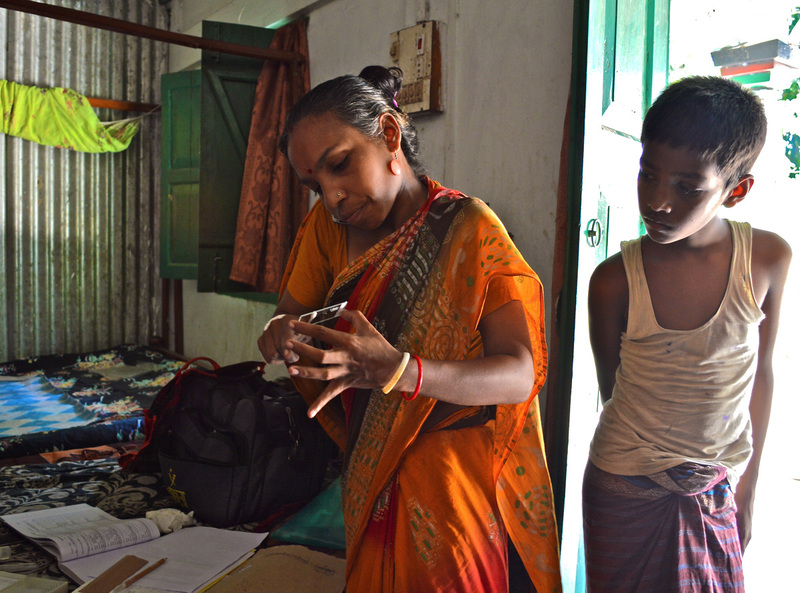 A community health worker conducts a home visit in 2013 with an expectant mother in Sylhet, Bangladesh, to screen for infections that have been linked to premature birth. Complications often come with these early deliveries. The baby may have more trouble breathing and keeping warm. As it turns out, you don't need fancy breathing machines or electric-powered incubators to save lives. A fish tank pump can also get an infant's lungs moving. A little sleeping bag can regulate newborns' temperature, without needing to be plugged into an outlet. Preventing a preterm birth can be harder than treating the baby afterward, according to Dr. Catherine Spong of the National Institute of Child Health and Human Development. In the U.S., factors that make it more likely that a pregnant woman will deliver her baby too soon include smoking and previous preterm births. In developing countries, spacing out births and providing better nutrition to expectant mothers can make for healthier babies. Midwives and other trained health care workers can help with the third major cause of infant mortality — complications during birth. There's some innovation going on here, too, including a device designed to help ease a baby's transit during obstructed labor. Keeping babies alive is not only good for families, it's good for society, health advocates argue. "If you can make the baby healthier in utero and get a healthy baby," Spong says, "the lifelong impact is huge."